Die Kleine geistliche Harfe was the first Mennonite hymnbook produced in America, prepared by a committee of the Franconia Mennonite Conference in Eastern Pennsylvania, and used in that conference district as the official hymnbook for over a century. It was printed at Germantown in 1803, with further editions as follows: Germantown 1811, 1820; Northampton 1834; Doylestown 1848; Lancaster 1870; Elkhart 1904. 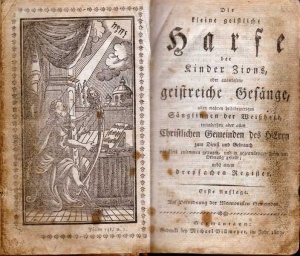 The full title of the first edition is as follows: Die kleine geistliche Harfe der Kinder Zions, oder auserlesene geistreiche Gesänge, allen wahren heilsbegierigen Säuglingen der Weisheit, insonderheit aber allen Christlichen Gemeinden des Herrn zum Dienst und Gebrauch mit Fleiss zusammen getragen, und in gegenwärtiger Form und Ordnung gestellt; nebst einem dreyfachen Register. Erste Auflage. Auf Verordnung der Mennonisten Gemeinden. Germantaun: Gedruckt by Michael Billmeyer, im Jahre 1803. This title covers only the first 40 pages, which contain only psalms, 30 in number. The second title, covering the main part of the book (412 pages with new pagination), reads as follows: Sammlung alter and neuer Geistreicher Gesänge, zur öffentlichen und besondern Erbauung und Uebung in der Gottseligkeit, insonderheit aber den Gemeinden des Herrn, auf Begehren guter Freunde, zum Dienst und Gebrauch mit Fleiss zusammengetragen in gegenwärtiger Form und Ordnung. Nebst einem dreyfachen und darzu nützlichen Register. Erste Auflage, Germantaun: Gedruckt bey Michael Billmeyer, 1803. This section includes an appendix (373-412), and contains a total of 475 hymns. It is followed by three unpaginated indexes 18 pages in length. All editions are identical in content (40, 412, 18 pages) except that a Zugabe einiger auserlesener Lieder of 20 pages containing twenty hymns was added in the second edition, which grew as follows: 1820, 21 hymns; 1834, 23; 1840, 24; 1870, 34. The 1870 and 1904 editions have a short title, Zions Harfe, pasted as a label on the spine. The preface to the first edition explains the reason for its publication. "Since the Psalms of David were in use in most of the meetings, and still were not available everywhere, and since in many meetings two or three hymnals were in use, it was thought useful to print a hymnal so that there could be more uniformity in the praise and worship of God our Saviour, Jesus Christ. Therefore a selection of spiritual songs was taken out of various spiritual songbooks, most of which can be sung to the melodies of familiar hymns. In the selection we were primarily concerned to choose such hymns as are needful and useful, in the light of the present dubious state of the Christian Church, for the encouragement and warning of souls desirous of salvation. For this reason the book is sincerely recommended to all evangelical churches in this land for their kind acceptance and profitable use." Since the Lancaster Mennonite Conference was also preparing a hymnal at the same time, an attempt was made to have the two groups unite in the publication of a joint hymnal. A meeting was held in Lancaster for this purpose, but the laudable intention failed. (See letter of Martin Möllinger of Lancaster, 20 February 1821, in Mennonite Quarterly Review 5 (1931): 55-57.) The Franconia delegation at the session reported having already brought together enough hymns for a complete hymnbook and having 3,000 subscriptions in advance, for "they have a large and strong church as well as a large district and are well-trained in singing." The Franconia delegates also reported that "their hymns had been handed in by so many brethren and dared not be omitted"; so they thought it best for the two groups to proceed with separate hymnbooks, the Lancaster group also having received many selections submitted by individual members. These comments give light on the method of selection of the hymns, a very democratic procedure. The sources of the selections can no longer be determined. Most probably a considerable number of contemporary European and American German language hymnals were used. The 30 psalms were obviously adapted from Lobwasser's popular collection. Only two of the Harfe hymns are also found in the Ausbund and these are standard parting hymns: "Lebt friedsam, sprach Christus unser Herr," and "Muss es nun sein gescheiden." The remarkable similarity (three-fourths identity) of the title-page text with that of Das kleine Davidische Psalterspiel (2nd ed., Baltimore, 1797) might suggest a borrowing of many hymns from that hymnal, but this is not the case. The same is true of the short hymnal of 56 pages, Die kleine Harfe (Chestnuthill, 1792) bound with the Psalterspiel. Clearly the editors of the new hymnal used the wording of the two title pages, and probably the very title itself was half-borrowed, but there is no evidence of dependence upon the hymnal itself for much hymn selection. The Franconia Mennonites were eclectic in compiling their hymnal, using standard German hymns and ignoring the only hymnal of their own heritage, the Ausbund. The Lancaster Unpartheyisches Gesangbuch used 64 hymns of the Ausbund. The Franconia and Lancaster hymnals had about half of their hymns in common. Seidensticker's listing (The First Century of German Printing in America, Philadelphia, 1893, p. 40) of an edition of the Kleine geistliche Harfe in 1753, which he calls "Hymnbook for Mennonites," is a manifest error. This hymnbook was used in Ontario by Mennonite settlers from the Franconia area at least until the publication of the Gemeinschaftliche Liedersammlung by Benjamin Eby in 1836. This book selected hymns from the Harfe and the Unpartheyisches Gesangbuch since the early Mennonites in Ontario came both from Franconia and Lancaster. Bender, Harold S. "Die Kleine geistliche Harfe." Global Anabaptist Mennonite Encyclopedia Online. 1955. Web. 21 Apr 2019. http://gameo.org/index.php?title=Die_Kleine_geistliche_Harfe&oldid=143533. Bender, Harold S. (1955). Die Kleine geistliche Harfe. Global Anabaptist Mennonite Encyclopedia Online. Retrieved 21 April 2019, from http://gameo.org/index.php?title=Die_Kleine_geistliche_Harfe&oldid=143533. Adapted by permission of Herald Press, Harrisonburg, Virginia, from Mennonite Encyclopedia, Vol. 3, pp. 195-196. All rights reserved.